Xiaomi Mi 6 finally goes official in China, the company's homeland. As rumored, Xiaomi did not launch two variants of the phone, and there's no Mi 6 Plus in real life. Xiaomi might announce it in coming months. However, speculations were not wrong regarding the specifications of the phone. 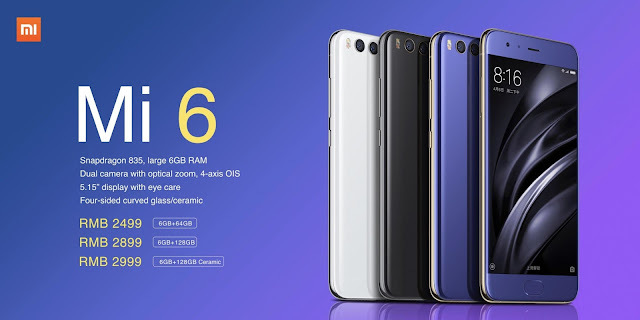 The Xiaomi Mi 6 retains the same display size of 5.15-inch as its predecessor Xiaomi Mi 5 and has Full HD resolution. At the heart of the phone is a Qualcomm Snapdragon 835 SoC, paired with 6GB of RAM and Adreno 540 GPU. The phone comes with two storage options- 64GB and 128GB. Xiaomi has added a dual rear camera setup on the phone with two 12MP sensors. One sensor will capture regular shots, and the other one is a telephoto sensor, same as the Apple iPhone 7 Plus. The phone comes 2*2 Wi-Fi band that delivers double speeds and broader range. It also has support for NFC for Mi-Pay. The Mi 6 comes with a larger 3340mAh battery with Qualcomm QuickCharge 4.0. There's also a silver colored variant of the phone, which looks incredibly dope. The Mi 6GB+64GB model will come with a price tag of 2499 Yuan ($363), and the 6GB+128GB variant comes with a price tag of 2899 ($421). The premium silver variant ships for 2999 Yuan ($435).